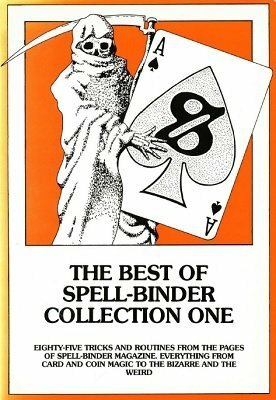 Eighty-five tricks and routines from the pages of Spell-Binder Magazine . Everything from card and coin magic to the bizarre and the weird. Sandwich Box by Stephen Tucker -- Signed selected card appears between 2 previously selected cards within closed card case. Mark by Stephen Tucker -- Alternate version of previous effect. Demonology by Bob Ostin -- Spectator signs card. Flames cause occult symbol to change to slip of paper with name of signed card. Signed card then revealed to have singed corner & occult symbol on back. Esti-Mate-Ion by Joe Dignam -- Spectator looks through deck & selects card. Magician reveals it. It's really that simple. Banned by Stephen Tucker -- Top card of deck pulled upward by spectator visibly penetrates rubber band around deck. Pockette by Peter Duffie -- Card selected. Ace of Spades buried in deck, found on top. Ace whispers location (pocket) of chosen card. Caught In Time by Roy Walton -- Spectator chooses time of day which is revealed in the cards. Polo 2 by John Fealey -- Roll of Lifesavers broken open to reveal bill. Corner torn from bill changes to coin large enough to pay for roll. Kontract Killer Kards by Stephen Tucker -- Spectator chooses card, found using four kings. American Express by Stephen Tucker & David Britland -- Coin travels from underneath one card to another & cards change places. Printing History by Phil Goldstein -- 4 blank cards to 4 kings. Xmas Time by Stephen Tucker -- 2 spectators look at magician's watch. Each sees it set to different time even though no time to reset it between glimpses. Tinted Glass by Phil Goldstein -- Packet trick in which spectator's chosen card reverses & changes color. Variations Variant by Roger Curzon -- Selected card vanishes from among 4 Aces while spectator holds them. Pentell by Mark Lee -- Cap of pen shrinks. The Magic Coin by William Goldman -- Spectator buys magic coin, keeping corner of bill as receipt. Instructions for magic coin opened, bill found inside. The Twenty-Four Card Trick by William McKay -- Spectator's card found twenty-fourth from top. Red/Black by David Britland -- Red & black Aces switch places. Showcase by Peter Duffie -- Card case melts from around deck. Gandwich by Tim Gan -- Sandwich Card routine. A Fourth For Dinner by David Britland -- Cannibal Cards routine. Born Free by Jerry Sadowitz -- 2 cards named by spectator appear variously at the top, bottom, etc. of deck. Lord Of The Ring by Stephen Tucker -- Stand-up coin routine with audience participation. Mexican Travelers by Steven Hamilton -- 4 Aces travel one at a time from hands to table. Diamond Tip by Jerry Sadowitz -- Packet trick with Ace through 10 of diamonds, with suit change climax. Zap by Stephen Tucker -- Flash appearance of coin in jaws of clothespin. Bodkin by Phil Goldstein -- Transposition between 2 unequal packets of cards. Arc De Triumph by Peter Duffie -- 2 selected cards found face down in face up deck. Two For The Price Of One by Stephen Tucker -- 2 selected cards named, with Torn & Restored card effect to boot. The Musical Deck by Alex East -- Music box movement plays selected tune. Tuesday by Stephen Tucker -- Alternate ending for a Four Ace trick. News Flash by David Britland -- Impromptu mental effect with borrowed newspaper. Inter Flight by Phil Goldstein -- Selected cards vanish from midst of 4 Queens to appear face up in center of deck. Aces A Go-Go by Shiv Duggal -- 4 Aces held between spectator's palms change to selected card. See Shell by David Britland -- Coin with signed label appears embedded in selected card. The Back Is Gone by David Robertson -- All cards except spectator's vanish from 5 card packet. Card revealed to have different back. Rosenthal Reverse by Harvey Rosenthal -- Selected card revealed face up in center of deck. Ambition Accomplished by John McClements -- 2 Aces produced & used in Ambitious Card routine, during which they find selected card. Ssap Kcom Ro Ffulb by Gordon Bruce -- Variation of Bluff Pass. Weird by Stephen Tucker -- Comedy mentalism routine with rubber fingers. Early Riser by Gordon Bruce -- Standup rising card routine that finishes clean. We Three Kings by Stephen Tucker -- 3 Kings appear in card case. Unbeatable by David Britland & Stephen Tucker -- Spectator selects own card from ribbon spread deck. Rest of deck shown to be Jokers. Thumbsucker by Martin Breese -- Comedy routine for magicians only. Whispered by Stephen Tucker -- 3 Queens whisper selected card to magician. CSB Through Table by Roger Curzon -- 3 different coins pass through table. Cal Pass by Monmoine Pascal -- Utility move to change one card for another. That'll Do Nicely by David Austin -- Selected card found with help of credit card. Beer Mat by Stephen Tucker -- Selected card appears under glass of beer. By Gum by Gary Osborne -- Coin vanish using sound for misdirection. Whisper Readers by Phil Goldstein -- 4 Jacks help locate chosen cards, which are shown to be marked on backs. Under Wraps by Stephen Tucker -- Selected card appears wrapped in banknote held by spectator. Jasper by Stephen Tucker -- Nice routine using Finger Chopper. Flip Side by Gordon Bruce -- Interesting method for producing coin from 2 cards. Top Deck by Stephen Tucker -- 2 Ambitious Card moves. Snowfall by Stephen Tucker -- Another Ambitious Card move. It's A Swindle by Bill Worsley -- Name chosen at random is found on back of selected card. Ace Rink by Stephen Tucker -- 4 Ace sucker effect. Slydinknot by John Brown -- Knot appears at one end of piece of rope, slides to other, & vanishes. Christmas Cord Knot Again by Stephen Tucker -- Alternate method for previous effect. Fagin by Brian Flannigan -- Card prediction on cigarette packet. Muzarre Vanish by Reinhard Muller -- Variation of Paul Harris' Bizarre Vanish. Stalking by Gary Osborne -- Coins Through Table routine with surprise ending. One Too Many by Ted Lesley -- Coin and then sip of drink travel from one hand to other. Xmas Sale by Daniel Kalinofski -- Utility move for loading coin into purse. Tidier by Ron Dowse -- Utility device for vanishing small objects. Red Rust September by Ian Land -- A Triumph routine in which the backs of two selections change color at climax. Drop Out by Stephen Tucker -- Comedy rising card routine for magicians. Stash Cash by Basil Horwitz -- Copper Silver transposition. Battlefield by Brian Flannigan -- Packet trick in which spectator selects only odd card in packet. Once And Future Kings by David Britland & Stephen Tucker -- Another Cannibal Card routine. Britlandeck by David Britland -- Trick deck routine in which prediction written on back of card proves to be correct. Without A Paddle by Ian Land -- 4 Ace Routine in which selected Ace turns face down. Experience by Stephen Tucker -- Card prediction routine with odd-backed card. Flushtronic by Paul Brignall -- 5 cards shown to be identical. They turn into royal flush. A Thousand Ways by Ian Land -- 3 cards selected & shuffled back into deck. 2 selections appear face up with 3rd selection face down between them. Reflection by Basil Horwitz -- ESP card prediction with 2 identical packets. Twice As Clear by Stephen Tucker -- Chosen card revealed Nth from top of deck where N is a number chosen by spectator. Still Counting by David Britland -- Advertising card helps find selected card. Amalgam by Stephen Tucker -- Mental routine with very clever working. Adder by Stephen Tucker -- Another mental routine. Pursperation by Stephen Tucker -- Coin routine involving borrowed pair of reading glasses.